This year Bournemouth’s Pride Festival ‘Bourne Free’ will take place from 12th until 14th July 2019. 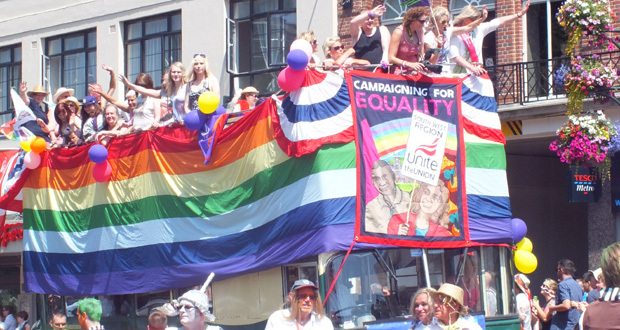 Now in it’s 15th year this annual LGBT festival is a celebration of all diversities that live in Bournemouth, attracting thousands of visitors keen to soak up the colourful atmosphere and join in the fun. Every year the organisers choose a different theme with the theme for 2019 to be decided. One of the big highlights of the festival is the parade which features a range of colourful floats, with music and dancing. The parade starts at East Overcliff Drive at 11.00am, and will go along the East Cliff, past Russell Cotes, along Westover Road and Gervis Place, across Richmond Hill to Bourne Avenue, around the Town Hall, through the Square past the Obscura Café and up to the Triangle. Any Dance Groups, Organisations, Charities, Businesses or individuals wishing to join the Parade can do so by completing the relevant application form on the Bourne Free website and returning it to the organisers. The fun will then continue at The Triangle which will feature a main stage with some fantastic acts plus there’s free family entertainment with singers and bands in the Lower Gardens Bandstand. The Triangle arena will be a ticketed event on Saturday. Please check back soon for further information. Plus also expect the local gay pubs and clubs to join in the fun with many offering special promotions and special guests. There will also be entertainment in The Triangle on Friday night from 5.00pm till 11.00pm which is FREE and open to all ages, so bring your family down for the open air showing on the big screen and great entertainment on stage! And Sunday sees a Sunday service by The Metropolitan Community Church Service followed by Coffee & Cake at Flirt Cafe Bar.